1. the erin condren planner i ordered on saturday night. i may or may not be checking the website for shipping status updates 32 times daily. 2. annabel’s halloween costume!!!! just like last night’s dinner, it’s probably not very befitting for my profession. but it has family history/significance. and i think it will be cuuuuute. 3. the madewell countrystripe songbird dress! it went on sale, and then there was 25% off of sale, so . . . it was fate. i even got it in 2 sizes in case one doesn’t work. especially if it’s less short on me [likely], i see this easily becoming a winter staples [with tights, a cardigan, and boots]. a couple other items may have snuck into my basket as well — and yet i have to admit the wardrobe purge hasn’t started yet. but i really am determined to make it happen, and to hopefully end up with a more functional selection of clothes — enough to make getting dressed every day more of a fun activity than a frantic search. given that a) this is the last year i’ll be wearing winter clothes for anything other than travel and b) day care is $$$, i probably shouldn’t go too crazy, but the current state of my closet is rather horrendous. and my current jeans/t-shirt uniform isn’t going to fly in the hospital next month. so . . . who says money can’t buy happiness? kidding. although interestingly i’d say the anticipation of said items is making me as happy as the items themselves arriving, and i’m sure THAT happiness will ultimately wear off. so i guess i can understand why some people order things constantly and then return them. the recipe was a little dated [reduced fat peanut butter? no thanks]. 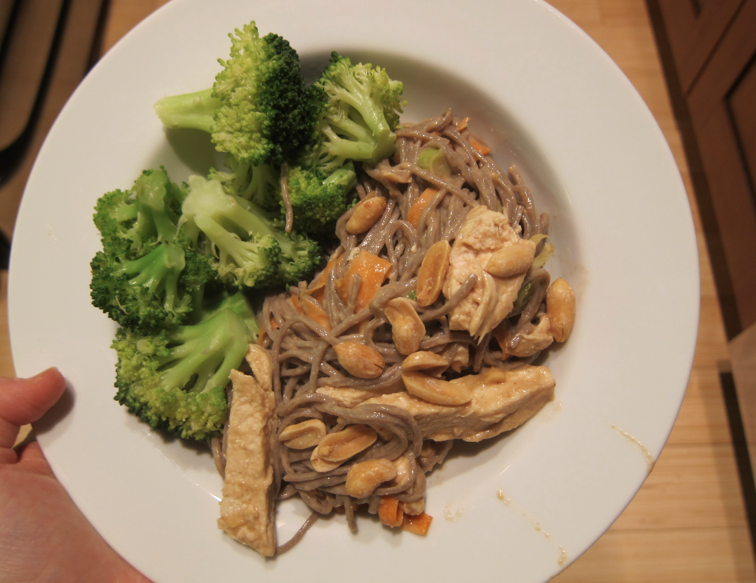 but it was fairly easy and tasty: spicy soba noodles with chicken and peanut sauce. a solid meal yielding plenty of leftovers. NOT light on the processed carbs [noodles!] but . . . as i mentioned, i’m not going to worry about that for now. excited to just see what happens!